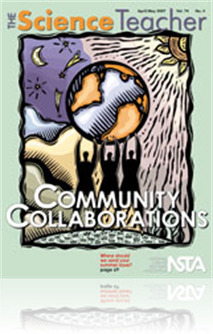 The National Science Education Standards offer the first assurance that community collaborations can be meaningful as they describe science instruction that educates students to “engage intelligently in public discourse and debate about matters of scientific and technological concern” (NRC 1996, p. 13). Community collaborations, if facilitated in a manner consistent with the Standards, can allow students to learn from and along with the community. The coeditor for this Community Collaborations issue of The Science Teacher (TST) hopes that as teachers read this issue of TST they will see the potential for engaging their own students in such collaborations in the coming year and look to share those experiences in next year’s issue. This article outlines the topic of that edition of the Science Teacher, written in May 2007 and still valid today. The author talks about the value of collaboration between a teacher, student and a community member. The collaborations in this particular issue are specifically ones that position students, teachers, and community members as producers of knowledge, not just users or people that add to data bases. As the author points out " Community collaborations engage participants in “living,” through experiences that push them to create, design, collect data, analyze data, make conclusions based on data, and share their conclusions with wider audiences."